Herders take their animals to drink water in Niger, which FAO says is among the countries currently in need of external food assistance. The food insecure countries on FAO’s list are: Afghanistan, Burkina Faso, Burundi, Cameroon, Cabo Verde, Central African Republic, Chad, Congo, Democratic Republic of the Congo, Djibouti, Eritrea, Ethiopia, Guinea, Haiti, Iraq, Kenya, Democratic People's Republic of Korea , Lesotho, Liberia, Libya, Madagascar, Malawi, Mali, Mauritania, Mozambique, Myanmar, Niger, Nigeria, Pakistan, Senegal, Sierra Leone, Somalia, South Sudan, Sudan, Swaziland, Syria, Uganda, Yemen and Zimbabwe. 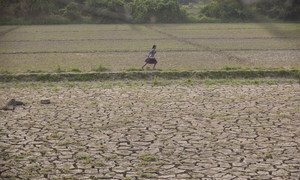 Turning to Asia, the cereal harvest is projected to remain similar to last year's, with recoveries in countries affected by unfavourable weather conditions, including Bangladesh, Viet Nam, the Democratic People's Republic of Korea and, to a lesser extent, Sri Lanka. While favourable crop conditions in India and Pakistan mean wheat outputs are expected to rise further, fair weather will not be enough to boost crop production in war-afflicted areas, as chronic conflicts impedes access to fields such as in Iraq and Syria, where this year's harvests are expected to decline further.